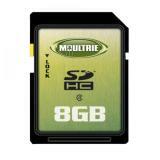 Moultrie's 8 GB SD memory card is an easy way to expand the number of pictures your digital scouting camera can store. Simply place the card into the memory card slot until it is fully inserted. View pictures by removing card and placing into an SD-compatible computer, TV, phone, or other device. You can upload data, erase and reuse without losing quality. It has a write-protect switch that prevents accidental overwrites or deletes. It can be used in all SDHC compatible devices. It can be used with all 2007 and newer Moultrie Game Spy game cameras.